Like burgers but tired of the same old veggie patty? 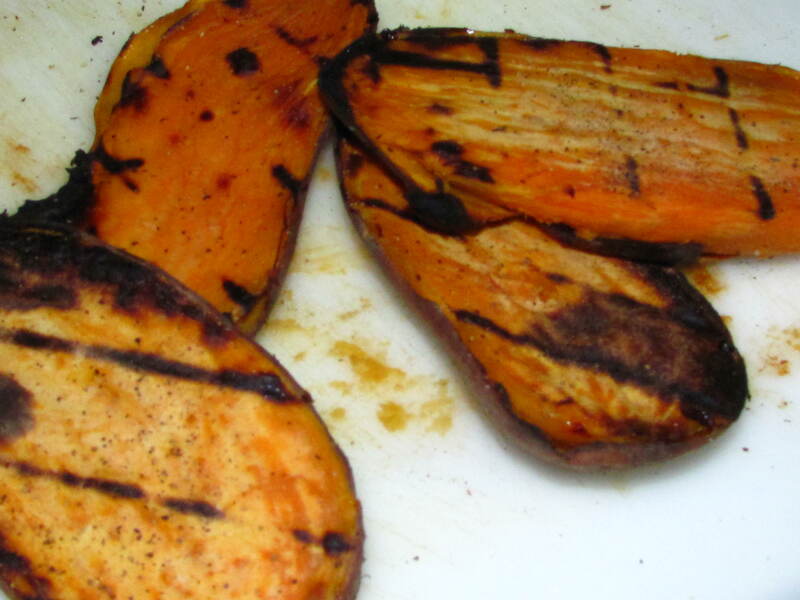 Switch it up by grilling humble sweet potato slices! This is an interesting flavor combination, nonetheless, but my husband had two of these tonight! Sorry to be so late on posting a 4th of July themed recipe, but I’ve been M.I.A. due to some personal reasons. But now I’m back and ready to tantalize your taste buds! The most helpful hint for this recipe would involve the potatoes. Make sure you parboil them really well or they’ll be raw and hard after they are grilled. Make sure they are very fork-tender, but you don’t want to over-boil them. I had a little trouble with this, but probably because the potatoes I was using were very large. But, the larger the potato, the better. Bigger ones cover more area on the bun. 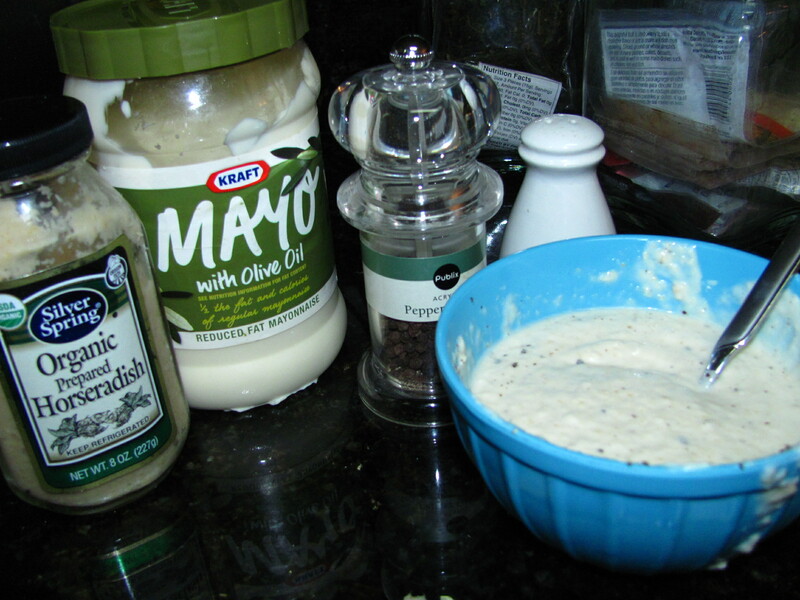 The horseradish mayo is super easy to make, and super tasty. I love the effervescent flavor of horseradish with the delicious taste of sauteed onions, especially seasoned with the herbs de provence. Mmm hmm! Once we had used all the grilled potato slices, I sliced them up like sweet potato fries (I know, I caved and had to recreate the delicious New Jersey fries I had at the bar as best as I could) with a side of horsey sauce. Mix all ingredients together in a small bowl and set aside in fridge until the potatoes are ready for the buns. slice onion very thinly. Heat the oil in a medium saucepan. Once the oil is hot, add the onions, garlic and herbes de provence and sautee on medium heat for 5-10 minutes. 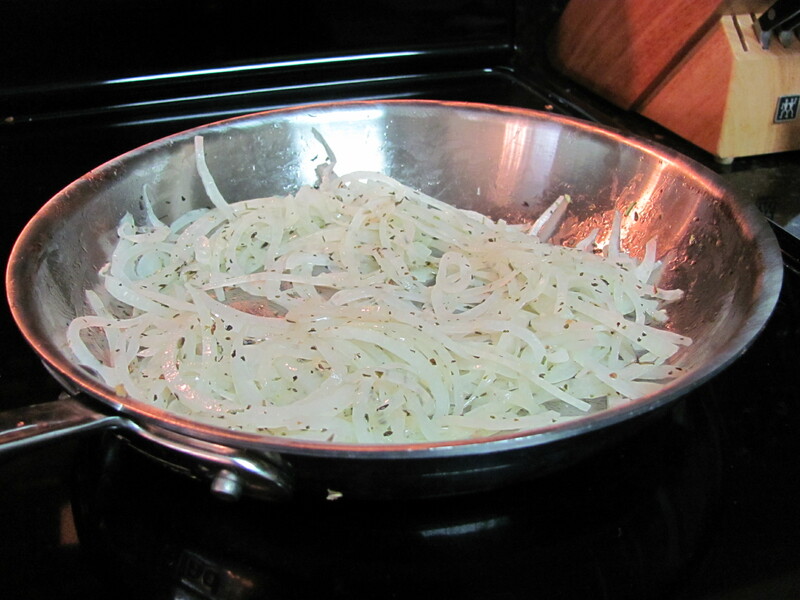 Then, reduce the heat to low/medium and sautee until onions are very limp and fully cooked. Set aside until it’s time to assemble the burgers. Begin by parboiling the potatoes. Bring a medium pot of water to a rolling boil and parboil the potatoes until fork tender. Do not over-boil. When done, remove from water and let cool. 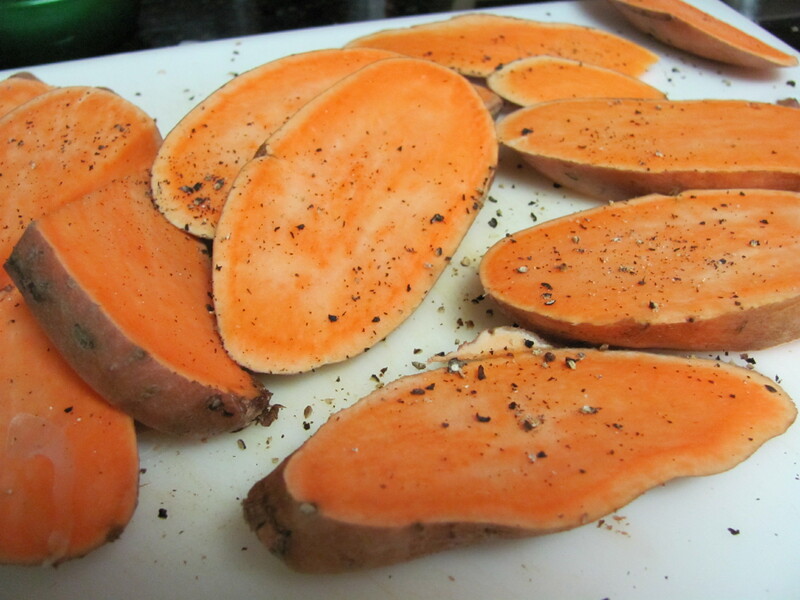 Once the potatoes are cooled, slice into 1/4 inch thick slices, with peeling on. Heat the grill to low/medium heat and grill until you get those nice grill marks. Don’t crank the heat up; take your time with them. It’s not the same as grilling a meat patty or meat hot dog. Low heat, I’ve found, works best when grilling veggies. Flip the potato slices as needed so they are done on both sides. Now, assemble the burger! 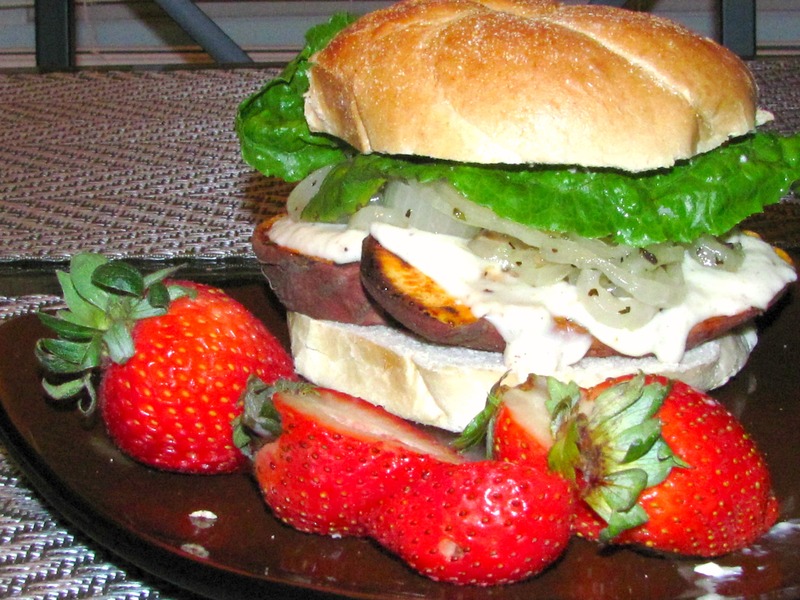 Place the sweet potato slices on the bottom, followed by the horseradish sauce, then the onions and garnish with optional romaine lettuce leaves. Tasty! What a great idea for a burger! 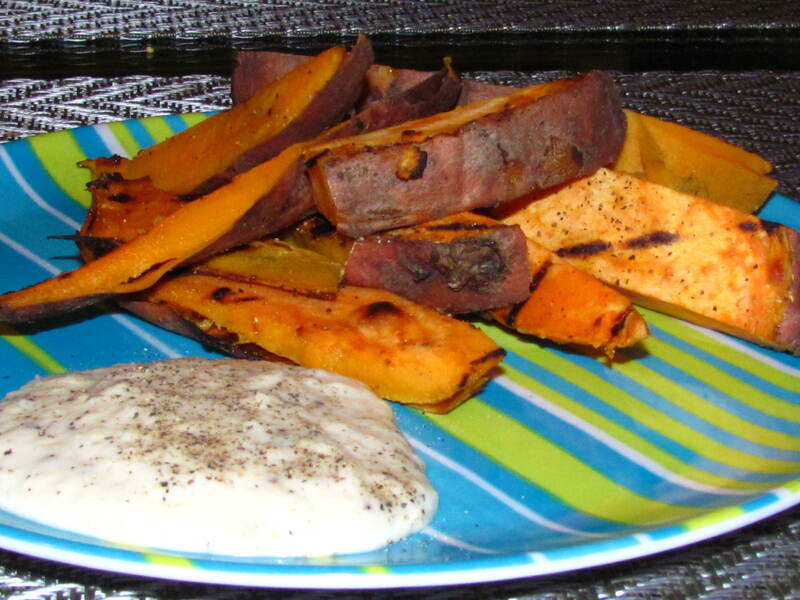 I could eat sweet potato in any way, shape, or form… too delicious!